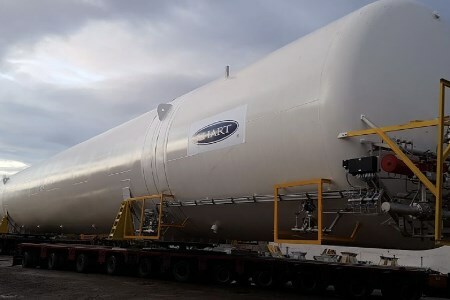 Three of Chart’s Decinske Giants cryogenic storage tanks, designed and manufactured for the Klaipeda LNG reloading station, have been shipped from the Chart Ferox facility in the Czech Republic and are en route to AB Klaipedos Nafta in Lithuania. River barges will first take the tanks to Hamburg where they will be re-loaded onto a sea cargo carrier and sailed through the Baltic Sea to the port of Klaipeda. Foundations at the site of the LNG reloading station have already been prepared, by partner company PPS Pipeline Systems, in anticipation of the first three tanks’ arrival in mid-March. The two remaining tanks, are scheduled to arrive from the Czech Republic at the beginning of the summer to provide an initial storage capacity of 5 million litres of LNG, which is about 3 billion litres of natural gas in gaseous form. "Having followed this complex reloading operation and witnessed that the first LNG tanks were successfully and timely loaded onto a barge, we are convinced that the project is being implemented according to schedule. It is very important that the world’s leading manufacturer of LNG tanks and distribution equipment Chart Ferox is taking part in the project. This means that we are supplied with high quality LNG storage tanks which will be safely shipped to the port of Klaipeda in due time. When the LNG distribution station is put into operation, the port of Klaipeda will become the LNG hub for the Baltic countries and north-eastern Poland." The LNG reloading station is aimed at creating a small-scale LNG operational infrastructure and developing the LNG market in the Baltic Sea region. The station will be comprised of LNG tanks with a total capacity 5000 m3. Gas from the floating LNG storage and regasification unit Independence will be delivered to the storage tanks by a gas tanker and distributed by road tank trucks or vessels. There are plans to expand the LNG station’s capacities up to 10 000 m3. The LNG station will be equipped with two truck filling stations and will be accommodated for reloading LNG onto gas tankers. "We value the very close cooperation with the customer, an operator of the Klaipeda Oil Terminal based in Klaipeda, Lithuania and project partner covering civil work and local permissions, PPS Pipeline Systems. Collaboration between our respective technical experts has facilitated first class performance in delivering this Lithuanian LNG terminal. Chart’s primary role is preparation and delivery of the cryogenic part of the terminal project, comprising five HT1000 LNG cryogenic storage tanks, two truck loading bays, one LNG bunkering jetty and the regasification plant. First commercial operation is expected in third quarter of 2017. Chart will support the customer in follow up projects and help to create the small scale LNG value chain for power generation, vehicle fueling and other end-use applications."